Many tourists planning a holiday on this island choose to fly into the Palma de Mallorca Airport and then hire a car upon arrival. Rental cars are an extremely popular mode of transport on the island, allowing you to drive to your hotel and travel between beaches with relative ease. A freeway encircles the Badia de Palma area, nearby the south-westerly shoreline, where it connects the attractions of Cala Major, Illetes and also the popular holiday resort of Palma Nova. From Andratx, you have the option the drive towards Sant Elm or Port d'Andratx. Many parts of Mallorca are linked by bus transport, particularly the most touristy locations. However, long-distance bus services can be a little sporadic and therefore this is not always a practical way to travel. Holiday makers simply wishing to learn a little more about the island may find that one of the regular sightseeing walking tours is the way to go and these are readily available around the streets of both Palma and nearby Valldemossa. The island is served by the ever-busy Palma de Mallorca Airport (PMI). A range of flights to Majorca (Mallorca) are available from many European airports, such as those in Belgium, Denmark, England, Germany, Italy, Portugal, Scotland, Spain, Switzerland and the Netherlands. It is possible to rent a car in the majority of the main tourist resorts and towns. However, during the peak summer season, it makes sense to secure your vehicle in advance, due to heavy demand. Those choosing to hire a car upon arrival at Palma de Mallorca Airport shouldn't encounter any problems with availability, even during the summer, although it should be noted that advance reservations do tend to be considerably cheaper than the 'desk' prices, even after some friendly negotiation. Of note, roughly 30 different car rental agencies operate around Palma. Mallorca buses are all single-decker and usually orange in colour. When you board the front of the bus, you either pay the bus driver, punch your ticket or show your travel card. When leaving the bus, always use the side exit if possible. The bus links between large towns in Mallorca are excellent and there are also good connections when travelling to smaller towns and village areas. Palma has its own municipal bus network and travelling by bus is relatively inexpensive, with popular onward destinations including Cala Ratjada, Ca'n Picafort, Port d'Andratx and Port de Pollenca, departing from the Carrer d'Eusebi Estada. At the weekend, it is worth noting that bus services are more limited and therefore it is advisable to plan your return journey before you depart. Scooters and motorbikes are extremely popular with holiday makers, simply because there are both cheap and convenient. They have the distinct advantage that they can transport you to some beaches that are not necessarily easy to reach by car. Taxis in Mallorca are a useful way to travel around the towns and visit nearby sights and attractions. In Palma, most taxis have a black and cream colour scheme. The taxi meters start at a basic fare, but passengers should expect additional charges for excessive luggage, night-time driving and journeys on Spanish public holidays. 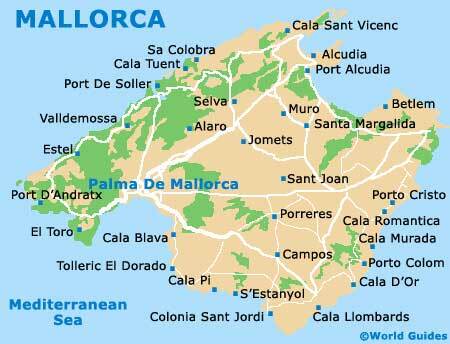 If you intend to take your own car to Mallorca, it will be necessary to use a ferry to travel to the island. There are regular services that connect various large towns on the Spanish mainland, along with the harbours of both Menorca and Ibiza. Travelling between Palma and Port de Soller aboard the vintage electric train is a real treat. The island's 'Red Arrow' electric railway line opened in 1912 and is reputed to be one of the most attractive in the whole of Europe.